If you work in financial services sales and marketing, chances are good that you have a familiarity with “the marketing funnel” – also referred to as the “buyer funnel” or “purchase funnel.” This is a consumer-focused marketing model which was developed in 1924 by William W. Townsend that illustrates the theoretical customer journey toward the purchase or adoption of a product or service. HubSpot, a major thought leader in marketing and sales software, has been active in reshaping this marketing theory visual over the past years as a concept applicable to their all-in-one solution AND to the greater marketing universe. HubSpot’s Inbound Marketing methodology developed by CEO, Brian Halligan, is about creating valuable experiences for prospects and customers through content. It is this core approach that has helped inform the evolution of the funnel shape regarding sales process and prospect progression. HubSpot has iteratively re-calibrated this shape to illustrate a model of a true measurable marketing process that works. Let’s explore how the marketing funnel has changed shape over time to better encompass the ideal sales and marketing process and mindset. For years, financial marketing professionals have operated under the top-down funnel approach, where many of the deeper details of each layer were subjective and undefined. HubSpot took the next step in applying the Inbound marketing philosophy to the old model. They began to flesh out details within the framework of content marketing – replacing the vague concepts tied to each layer with specific customer-centered descriptions of the actions, channels and core assets that better define each layer. But questions remained: Is one layer of the funnel more important than the others? The size and width of the top layer suggests this. And what happens to the customers after they pass through the last layer of the funnel? 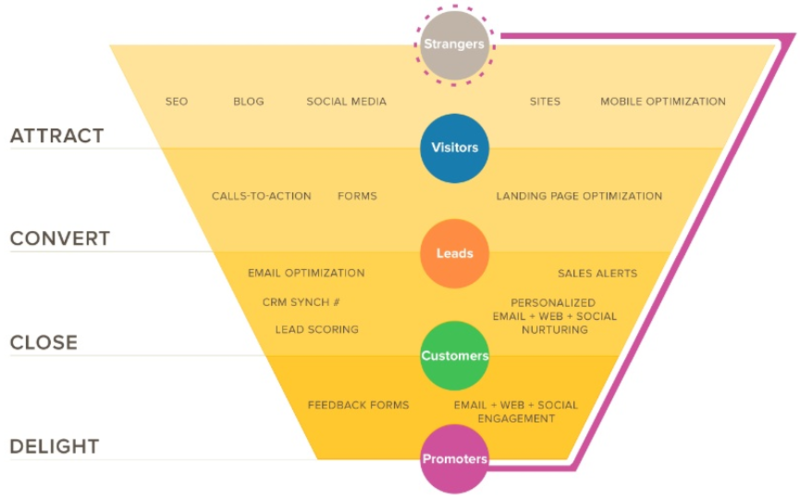 Then, in 2013 HubSpot re-imagined the traditional shape and orientation of the marketing funnel. One that aligned more closely to the inbound marketing philosophy. They changed the vertical top-down model into a horizontal model with evenly-distributed layers. While each layer was now equally important, some problems still remained. First, the linear approach was problematic in terms of growth measurement and momentum, and the same question was still going unsolved: What happens to the customers after they pass through the last layer of the funnel? After the customer experienced Delight, the entire process comes to a halting conclusion. All successful marketers know is not the case. There was clearly room for further improvement. At HubSpot’s annual 2018 INBOUND event CEO Brian Halligan shook up the fundamental marketing mindset when he presented the newly re-engineered inbound marketing philosophy funnel concept — which wasn’t a funnel at all – but a flywheel. The genius of the circular flywheel model is rooted in basic physics. A funnel is set up to lose momentum at the bottom, but a flywheel is a dynamic and efficient shape which spins at a pace relative to the energy that is put into it. And as points of friction in the sales and marketing process are removed from the flywheel, it will spin results more efficiently. Notice that this model attributes evenly-distributed weights into each segment of the flywheel, but it also leverages delighted clients as a key driver of momentum. 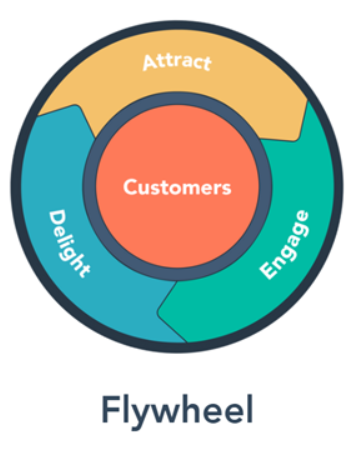 The HubSpot Inbound Marketing flywheel model represents a process in which customers participate in ongoing growth. By retiring the old marketing funnel ideas, the shapes of which lose energy at either the bottom or the end, and replacing it with the new flywheel concept, sales and marketing can shift into a new plan mindset that is rooted in momentum. This model not only describes marketing process, but it describes a forceful model for how a business should operate. It can be adopted by virtually any company seeking to leverage their marketing by investing in customer marketing and advocacy initiatives, but is especially relevant to the financial services industry. The flywheel absolutely reinforces this concept for financial marketing firms. At Gate 39 Media, we believe the Inbound marketing methodology works particularly well in the financial industry; Firms often compete through quality content production, producing content such as market reports, educational articles, e-books, and media appearances. In financial services, keeping the “delight” stage going is particularly important as most financial services are extremely competitive with many customers perceiving limited differences in providers and pricing. A differentiated edge can be created using content and the “delight” stage provides customers with information, tools, and service that makes it easier to conduct more transactions as well as solidify a client’s loyalty. Identify points of friction between customers, employees, and points of hand-off between internal teams that affect customer experience. By clearly defining your organization’s service forces, automating processes to help reduce friction, and setting up goals your organization’s own marketing flywheel will be ready to roll. Need help calibrating your flywheel? 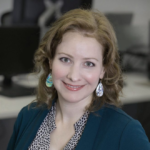 Have questions about Inbound Marketing and your business? Share them with us.